This weekend, Greenville, South Carolina-based grindcore quartet WVRM embarks on their North American tour in support of their recently-released Can You Hear The Wind Howl EP. WVRM's new tour appropriately kicks off tonight with a performance at Wvrm Fest 5 in Jacksonville, Florida with the likes of Dark Castle, Yashira, Ad Nauseum, Vatican, and more. The band then joins up with their cohorts in Prosthetic Records' Funeral Chic for sixteen shows. The tour runs through Charlotte, Nashville, New Orleans, Austin, Al Paso, Scottsdale, San Diego, Tijuana, Los Angeles, Long Beach, Las Vegas, Albuquerque, Dallas, Little Rock, Memphis, and ends in Atlanta on December 18th. The Los Angeles show sees the bands taking part in For The Children 2017 with the likes of Infest, Terror, Agnostic Front, Ramallah, All Out War, Strife, Xibalba, and many more. See the full confirmed routing below, and watch for more upcoming WVRM tour announcements for early 2018 in the coming weeks. 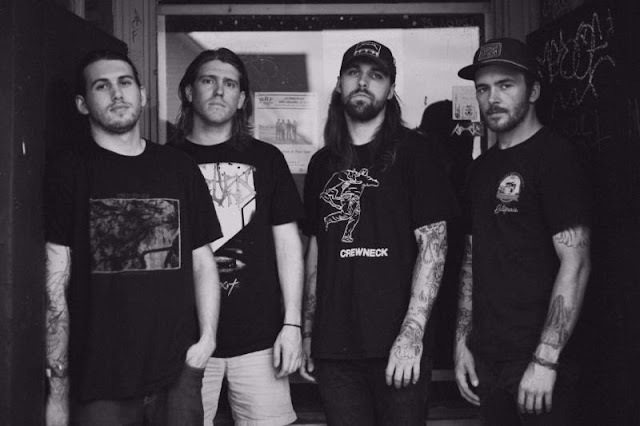 Unloading six track­s in barely nine minutes, WVRM's Can You Hear The Wind Howl is a brutally-charged and volatile display of metallic grindcore unrest. Can You Hear The Wind Howl was recorded at Converse Rubber Tracks, engineered and mixed by Kurt Ballou (Converge, Black Breath, Sect), mastered by Brad Boatright (Integrity, All Pigs Must Die, Nails), completed with artwork by Searing Limb, and released in late September through To Live A Lie Records. WVRM's caustic tones, belittling percussion, and searing vocals coalesce into an onslaught fans of Dead In The Dirt, The Drip, Torch Runner, and similar acts should not pass by. WVRM's Can You Hear The Wind Howl can be streamed in its entirety and purchased digitally and on 7" vinyl RIGHT HERE. Formed in late 2013, WVRM released Despair in 2013 and Where All Light Dies a few months later in 2014, both pressed on a very limited run of cassette tapes. These short, fast albums of lo-fi noise and desperate extremity culminated in the release of the band's first full length work, late 2014'sSwarm Sound cassette and 2015's self-titled 7", both by Southern Druid Records. A split cassette with Self Harm was released in 2016, followed later that year by Heartache on To Live A Lie Records, who now offers Can You Hear The Wind Howl,WVRM's loudest and most principled release to date.